I see the question asked so many times and in so many ways. What is the best wood to use for smoking? What is the best wood to use for smoking (fill in the blank with your favorite food)? I’m going to shake things up a bit by stating there is no rule book saying a specific wood must be used with a specific food. There are, however, some basic things you should know to reduce the risks of toxicity, damage to your equipment, and overall ruining your barbecue. Use the wrong hardwood and you can bitter any food you expose to that wood’s smoke. Right up front, let me tell you, only smoke with hardwood. Softwoods or coniferous woods should never be used for cooking because they have elevated sap levels and more air in their cell structure. This causes the wood to burn fast, hot, produce lots of sparks, and produce unpleasant flavors not ideal for flavoring foods. Let’s be clear on what a softwood is: pine, redwood, cedar, fir, spruce, hemlock, larch, cypress. I realize that cedar has been a popular softwood used for plank cooking or wrapping foods. If you want to learn more about the risks associated specifically with cedar, see my earlier article and learn why you should discontinue this practice. Part of the Birch family of hardwoods, Alder is a relatively soft hardwood of medium density. It is most commonly used to smoke fish but can be used with mild poultry cuts, pork, vegetables, fruits and spices for natural wood flavoring/smoking. The flavor profile is mild on our scale of boldness. Alder provides a neutral coloring to the outer skin of foods and is the preference for those who like to cold smoke. Ash hardwood is part of the Oleaceae family or olive family of hardwoods and can be used with any food for natural wood flavoring/smoking. The flavor profile is on the light side making it ideal for most any food but in particular, it works great with wood-fired pizza as it can lose moisture quickly providing for a great bed of coals. Ash provides a neutral coloring to the outer skin of foods. Considered a lightweight hardwood, Aspen is known to have “wet pockets” which can lead to some difficulty with using this as a cooking wood due to its tendency for bacteria development. Variations in moisture can result in temperature variation during cooking which is directly opposite the goal when fire cooking. This hardwood is known as the preferred wood for carving. It grows commonly with red oak, white ash, and sugar maple trees. This wood is soft and light which makes it a quick burner. It does not have any notable odor or taste which makes it a poor choice as a cooking wood. This hardwood grows in large stands and mixes in with many of the other dominate hardwoods. It is a popular filler wood for making charcoal so you know it burns long and evenly. It is classified as moderate in flavor boldness. This can be an ideal firewood choice due to the prevalence of the varieties of birch and the strength of the wood itself. However, it is not a highly flavorful hardwood for cooking and burns too hot. If used for fire cooking, you will have a challenge controlling the cooking temperature. This hardwood produces a poisonous nut as well as twigs. For that reason alone, it is not recommended as a smoking/cooking wood. This hardwood belongs to the genus that includes walnut though it is not as weight-heavy a wood as walnut. Don’t let the name confuse you. There is no buttery taste to this wood. In fact, it does not offer any balanced qualities when used for cooking and for that reason, is not recommended. Like Oak, there are many species within the genus of cherry. It has an obvious fruity aroma and tends to light easily producing a steady burn and flavor. Wild or forest grown cherry is very different from orchard cherry which can have bitter undertones which may in part, be due to the chemical application commonly applied to nursery trees. Feel free to use it with poultry, beef, pork, lamb, even vegetables, as it is a workhorse when it comes to flavoring foods. Be sure to use a meat probe when cooking with cherry wood as this wood provides a reddish-pink hue to the meat that can easily be mistaken for under-cooking. This is a very hearty hardwood that is resistive to decay so it is not necessarily an easy lighting wood. It can be used for smoking though I certainly feel there are better choices out there. This hardwood is part of the genus that contains the aspens and poplars. As such, like its siblings, it does not make for a good smoking wood. In fact, when it becomes wet, it produces a sour odor which can transfer to food. Although this is a dominant hardwood in the USA it is a hardwood that has no characteristic odor or taste. For that reason, it does not make for an ideal cooking wood. A very heavy hardwood that holds moisture for indefinite periods of time which causes it to be a poor choice for pleasant smoke flavors. This can produce musty aromas that can transmit to foods. This is a moderately hard wood that has a yellow to grayish heartwood that does not make it the best choice for smoking. The benefits of exposing food to this wood are not well documented and for that reason, is not an ideal choice. Since these hardwoods are part of the same genus they share similar qualities: dense wood that is strong, can be difficult to lite, but produce a lot of color and flavor to foods. What should be noted here is that not all the species are the same. Some hickory varieties are very bold and can have bitter undertones. It is important to learn the differences between varieties before selecting one for cooking. 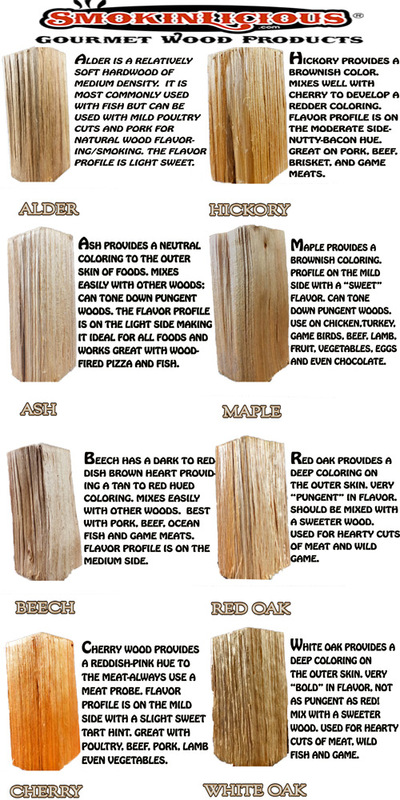 There are over 120 species of maple so let’s clarify some of the terms. Sugar maple and black maple are also called hard maple. Silver maple, red maple, and boxelder are called soft maple. These maples make for excellent smoking and cooking woods producing beautiful even coloring and a moderate flavor level. This is not a heavily populated hardwood in the USA and it is a slow grower. It can be confused with Hickory due to similar coloring. However, it does not produce the same flavors as hickory. An extremely light hardwood that does not hold any ideal moisture for smoldering to produce a clean smoke. Poplar burns too quickly to be an ideal choice for cooking. Although this hardwood has a medium weight and can burn evenly and for good length, it does not do anything for coloring foods or adding any pleasant flavor. For this reason, it is not recommended for cooking. The oaks are the one hardwood that worldwide dominates with the greatest number of species. This is a heavy wood that can be difficult to light but once it ignites, it produces intense smoke and flavoring that is easy to distinguish when consuming foods cooked over it. Red oak has a strong aroma and flavor, requiring a trained hand to use it. One of the heaviest hardwoods available, it belongs to the same genus as hickory and pecan. If classified as smoking, it is on the bold side and should be used in small quantities. The wood produces a very dark outer “bark” coloring. Similar in structure to Red Oak, the white variety tends to be less strong aromatically though it still produces an obvious bold flavor to foods. Because it is a heavy, dense wood, it holds moisture for a long time making it more ideal for hot smoking and grilling rather than for cold smoke application. There you have a quick guide on the hardwoods of North America and those considered ideals for fire cooking. Experiment and keep a written log of what works with the other ingredients you use in your wood cooking. Hope you enjoyed our discussion of what wood to use for smoking! For thousands of years, it was the only way to cook. Many believe that this discovery separated man from the other animals. Fire. Estimated to have been discovered some 2 million years ago, the discovery of fire and more importantly, the discovery of how to tame fire, resulted in man’s brain development, value of food, changes in our body, and social structure. It gave us survivability. It extended our life by improving daily calories and nutritional needs by allowing us to cook poisonous plants and meats. There are some scientists who believe that fire cooking was found by accident. A lightning strike or grass fires that sprung up due to the excessive dry conditions exposed to the hot sun. Many don’t feel man did anything to “discover” fire other than observe the characteristics of fire: it produces abundant heat, light, and when it traps an animal within its flames, it produced a more tender meat, easier to digest food source, and more pleasing aroma to the meat. There are others who believe that early humans realized the importance of tools. By sharpening stones to produce spears, cutting tools, etc., these early beings observed spark. Either through intention or perhaps with Mother Nature’s assistance, these sparks caught twigs, brush, fruit, and/or grains on fire. Remember, early human life did not involve a developed brain. A discovery of fire, however, would help advance not only our brains, but our bodies into the erect beings we are today. In South Africa’s Northern Cape province, a dwelling known as Wonderwerk Cave, contains the earliest evidence that our ancestors and apelike ancestors were using fire. Compacted dirt showed evidence of ashes, carbonized leaf and twig fragments, and burnt bits of animal bones. Scientists were then able to analyze this material and determine that the fragments were heated between 750 and 1300°F, which is the heat level of a small fire made of twigs and grasses. If indeed our earlier species learned to harness fire for cooking, this would account for the advancement of our brains and our ability to become erect beings walking on two legs. Cooking on fire allowed for easier chewing and digestion and produced extra calories to fuel our brains. Fire also warded off nighttime predators, allowing for sleep on the ground or in caves rather than in the trees. Raw food diets have been popularized as a method of losing weight and of being healthier. However, only a fraction of the calories in raw starch and protein are absorbed by the body via the small intestine. 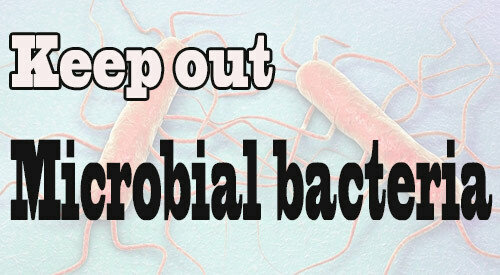 As a result, the remainder passes into the large bowel, where it is broken down by the organ’s high population of microbes, which consume the majority for themselves. However, cooked food is mostly digested by the time it enters the colon. For the same amount of calories ingested, the body gets roughly 30 percent more energy from cooked oat, wheat or potato starch as compared to raw, and as much as 78 percent from the protein in an egg. In experiments, animals given cooked food gain more weight than animals fed the same amount of raw food. Coming up in The History of Fire Cooking: Part II, learn more about why cooking foods by fire made us who we are today. In conclusion, did we provide you with new information you didn’t know? Additionally, leave us a comment and subscribe as we bring recipes, tips, techniques, and the science behind the fire and smoke. You love different techniques for cooking and absorb new information like a sponge. In particularly, you love outdoor methods of cooking. One of your favorites is plank cooking on cedar wood. Every time you read a recipe, they all call for use of a cedar plank or cedar wrap. But is cedar really the best choice? More so, is cedar a safe choice? Cedar wood is not a hardwood. It is a softwood that is from the gymnosperm trees meaning, it is a conifer or cone producing tree. 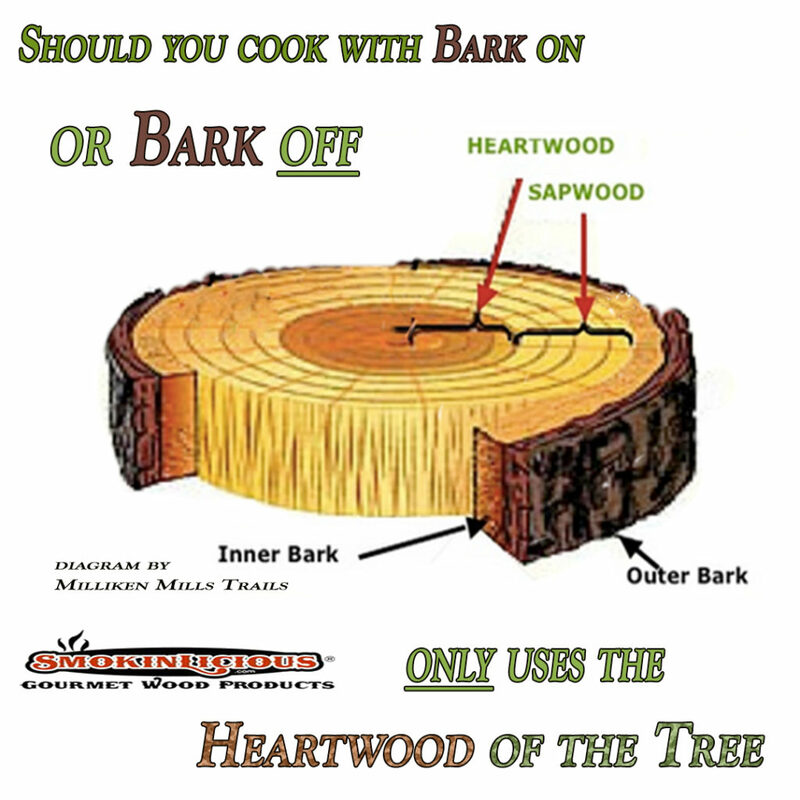 As a rule, softwoods should not be used for cooking as they contain a lot of air and sap which equates to a fast burn and unpleasant flavors. In fact, there are many softwoods that can be toxic if cooked over. During plank cooking, you are using the wood as a vessel to infuse flavor to whatever food is placed on top of the plank. Here’s the concern with cedar – because it is a lower density wood (23 lb./ft³), it has very poor fire resistance. That means, it reaches full combustion much faster than hardwood and will burn as a result. Certainly, that’s not what you’re looking for when you plank cook. Unlike hardwood which contain pores in the cell walls, softwoods like cedar are poreless. They use cell components called tracheids to transport water and nutrients. In addition, the organic compound lignin found in the cell walls, is much lower than in traditional hardwoods used for cooking. Why is this an issue? Lignin is what gives wood fired cooking the distinct flavor and aroma to foods. For cedar, the average lignin composition is 20%±4 compared to common hardwoods used for wood-fired cooking which average 28%±3. Cedar contains chemical properties (specifically plicatic acid) that are shown to be a good absorber of odors and moisture. This is one of the key reasons why cedar is a preferred softwood for pest control to keep fleas, ants, mites, moths, and mosquitoes away. When exposed to plicatic acid for lengthy periods of time, a condition known as “cedar asthma” can develop. Additionally, a regular exposure to the cedar oil found in the wood can result in contact dermatitis or skin irritation, rhinitis, and conjunctivitis. There are many studies available on how the use of cedar wood chips and shavings have affected animals continually exposed to these products. Most studies show a correlation with liver dysfunction in animals such as rabbits, guinea pigs, and hamsters. In fact, smaller animals, like guinea pigs and hamsters, have a higher incidence of death which may be attributed to plicatic acid exposure. The phenols and aromatic hydrocarbons also have been shown to cause respiratory problems in animals like those listed above. Cedar is part of the pine family of trees with native origin in North Africa and Asia. There are no native cedar trees to North America. The red cedar common in the Eastern USA is part of the Juniper family and can be highly toxic if taken internally. Under no circumstances should you ever cook with red cedar from the Eastern states of the USA. USA cedar trees are referred to as false cedars since there are no native varieties. There are commonly 5 varieties of the false cedars available: Western Red Cedar (common to Southern Alaska, Northern California, and the Rockies), Northern White Cedar (Southeastern Canada, Northeastern quarter of the USA, south into Tennessee, and west into Iowa), Eastern Red (Aromatic) Cedar (Eastern USA), Yellow Cedar (Pacific Northwest from Alaska to British Columbia into Oregon), Spanish Cedar (although Native to South and Central America, it was planted in Florida). Every false cedar has some known health risks with the most common being respiratory due to toxicity of its pollen, oil, or other chemical compound. 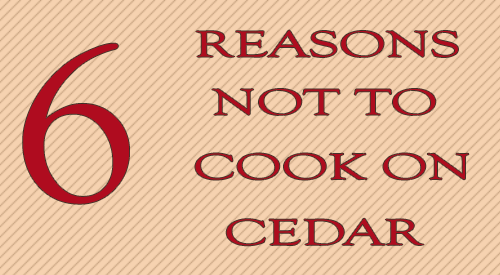 “So if there are all these documented health risks, how did cedar plank cooking gain so much popularity?” I suppose the easiest answer is that cedar was used by the earliest settlers in the Pacific Northwest as a means of preserving, storing and cooking the seasonal fish. Think about the limitations of the day: they would be using resources that are available without thought to the items we ponder today like health, future risk, etc. This concept was examined from a different perspective many years later with the desire for flavor, appearance, and functionality. We often make the mistake of jumping into something full throttle before asking some of the key questions to keep our bodies safe and healthy. Remember, there’s lots of documentation out there stating why you should not cooking with softwood yet when it comes to plank cooking, specifically, cedar plank cooking, we don’t seem to carry that issue forward. I don’t think I’ll ever understand why. We love providing information to our readers and subscribers that is not in the open and letting you weigh the information for your own verdict. All types of questions are welcome and we encourage you to follow and subscribe to our social channels so you don’t miss anything. We look forward to providing you with tips, techniques, recipes, and the science for all things wood-fired cooked. 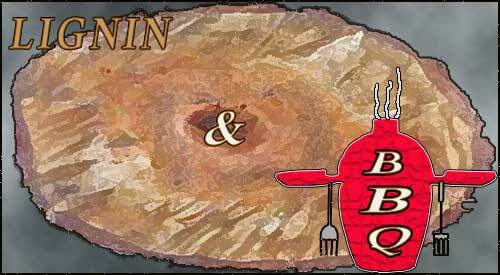 We discuss the pros and cons for smoking foods in foil- in particular your BBQ and how it can affect the food. It is a common question heard when it comes to hot smoking. In fact, there is even a technique called the Texas Crutch that relies on wrapping meats like ribs, pork shoulder, and brisket in foil with 1-2 ounces of liquid into the foil and then sealing all ends tightly so no liquid or steam escapes. This process tenderizes and speeds the overall cooking process, which with hot smoking, can be quite lengthy. Here’s the thing – when you use this technique, you do so after the meat product has cooked to about 135-150°F. That means a great deal of smoke flavor has already penetrated. What about if you start out smoking foods in foil? Let’s look at the pros and cons of smoking foods in foil, information you can use for traditional oven cooking as well. Aluminum leaches into foods that are wrapped in it. Current research indicates that the average person can tolerate about 2400mg of aluminum exposure per day due to our body’s ability to excrete the small amounts of this metal efficiently. Therefore, any ingestion levels over this would be considered a health risk by the World Health Organization. Aluminum foil is disposable so it is a convenience. 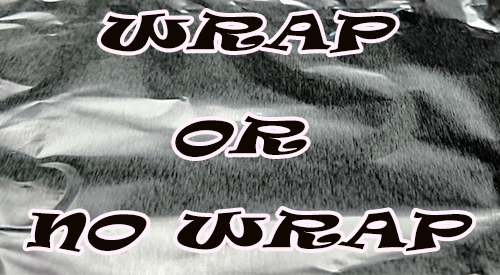 There is no clean up when you cook foods in foil and often there are recycling programs that accept used foil. It can save on degrading your cookware and grill grates. Aluminum is found in other items like corn, yellow cheese, salt, herbs, spices, tea, cooking utensils, and in over-the-counter medications like antacids. A derived from aluminum is also used during the purification process of drinking water. These all must factor into the recommended daily intake of this metal, meaning you need to assess whether cooking in foil will put you over the daily recommended limit. Aluminum foil aides in producing a convection heat as it is an excellent heat conductor. Thus, cooking times can be significantly reduced when foods are placed in foil. Foods with higher levels of acid have a higher rate of leaching aluminum into them. This is true whether the acidic ingredient is in solid or liquid form. In fact, acidic liquids have a higher leaching rate than solids. Give this consideration when working with foods such as tomatoes, vinegar and citrus items. Using aluminum foil can tenderize tougher cuts of meat when you include an ounce or two of liquid. Additionally, aluminum foil is leak proof when you seal all ends. When you cook acidic ingredients in foil, both the appearance and taste of the foods can be altered by the reaction to aluminum. The tastes are often described as metallic. From the smoking perspective, if you start the foods on the grill grates without any aluminum foil, cook until 135-150°F internal temperature, and then wrap in foil to finish, you likely will find very little change in taste. Ingredients containing acid would have cooked down and not be at a level that would interact as aggressively with the aluminum. If you do elect to cook on the smoker, charcoal grill or LP grill with foil, know that you can see firsthand the reaction of the aluminum with food ingredients. You can see the wood molecules by the smoke vapor particles that develops on the outside surface of the foil. As foil is a heat conductor, it also is somewhat of a sponge and will steal some of the smoke vapor particles from the food. Remember, one of the key benefits to using aluminum foil is its ability to seal tightly whether preventing spillage to a piece of cookware or sealing in liquids for cooking. 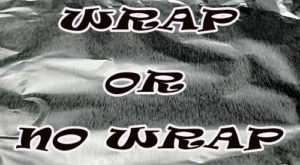 Cooking smoked items wrapped in foil from start to finish will not allow for full penetration of the smoke vapor particles that account for the unique color, texture, and taste to smoked foods. Plus, you likely will increase your risk of health issues with repeated exposure to high aluminum levels. Thank you for the question submission and we hope you found value in our information. We welcome all types of questions and encourage you to follow and subscribe to our social channels so you don’t miss anything. We look forward to providing you with tip, techniques, recipes, and science for all types of wood-fired cooking. IS HICKORY THE WOOD TO SMOKE & GRILL WITH? Our Hickory double filet is great for most smoking or grilling equipment – So YES-HICKORY THE WOOD TO SMOKE! The question is one of the most common we hear. What is the most popular wood you sell? Initially, our response was that there wasn’t one hardwood that was dominating the order system. That certainly has changed over the course of the past few years. Without question, Hickory has become the most requested hardwood. Why Hickory The Wood To Smoke? I truly believe the catalyst for the popularity of hickory particularly for smoking foods, is television and YouTube. 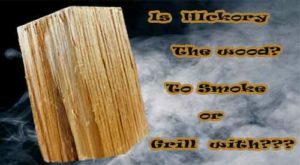 Yes, all those cooking and food shows and YouTube channels have catapulted grilling/smoking with wood and charcoal leaning toward Hickory. As if Hickory is the only choice for “real” barbecue. Some of the roots of the popularity of Hickory is the generational secrets of barbecue. Hickory has been, for many decades, a commonly found hardwood in the traditional barbecue states who are credited with bringing barbecue to the limelight. North Carolina, South Carolina, Georgia, Virginia and then advancing west to such states as Tennessee, Missouri, and Alabama. Gradually, those who wanted to duplicate the smoke flavors of the south continued to request hickory. The result: hickory has become one of the highest demand hardwoods in North America. Is There a Holy Grail for Smoking Wood? Without question, those known in the world of barbecue as major players have stimulated the belief that their choice in smoking wood is the key to their success and notoriety. Here’s is the conflict: many fail to admit that there are many other factors that account for their success. Although they may have made their mark by sticking with that one wood for the entire time they cooked and gained popularity, they also committed to specific equipment, fuel product say a specific brand of charcoal, meat supplier, whether they keep the bark on the wood or remove it, and brands or recipes for rubs/sauces/marinades. 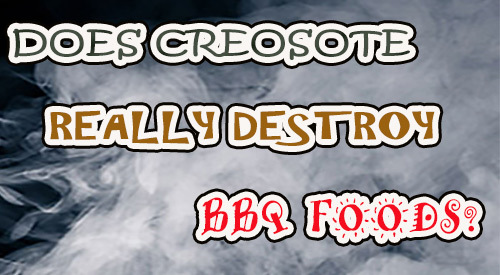 ALL these items factor into the overall success of a cooking event even in barbecue. I won’t get into the details about one brand of charcoal or briquette over another, or the influence of a wet or dry rub on the meat’s ability to absorb smoke vapor. Those discussions will be for another day. What I will stress is that the climate and soil of tree’s location is by far a key determinate in whether it will make a great smoking or grilling wood. Specifically, the more balanced the pH level of the soil the tree’s roots are bound to and the amount of precipitation the tree is exposed to in a given year, directly affect how favorable the wood will be for smoking, grilling, and cooking in general. I’m often told by new customers who had previous experience with hickory and found it to be too strong in flavor, producing too dark a coloring to the food’s exterior, and often producing a sooty appearance to both the food and equipment, that once they tried our wood, they had the exact opposite result. Why? The easiest answer is we simply have better-growing conditions in the Northeast than other areas that grow Hickory trees. Plus, we have access to the better species of this hardwood family. With over 20 species of Hickory in North America, they are not all equal when it comes to cooking with them. Many of these 20 species are known to produce bitter undertones when foods are exposed to their smoke vapor. That means poor results for the cook or Pitmaster who believes in hickory for their food production. I like to compare hardwoods for cooking to extra virgin olive oil. 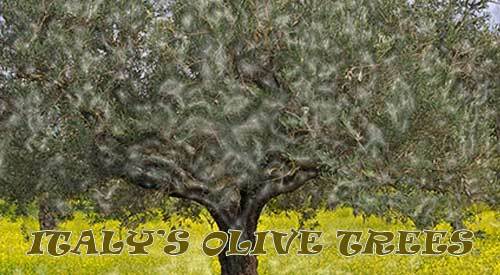 There are hundreds if not thousands of brands of olive oil available. Yet, many producers marketing an extra virgin olive oil (EVO) are using low-grade oils in the production rather than meet the requirements for EVO labeling. Wood is similar. There is no obligation to label where the wood comes from, how old it is, how it was processed, what species it is from, and if it is from the raw material of the timbered tree or a by-product or waste product of another use. Just like olive oil producers using pomace or the olive residue left over from the traditional production of olive oil, hardwood can be a leftover as well and re-purposed into something it wasn’t initially intended for. My hope is that I’ve stimulated some thinking into what makes for a great smoking wood, grilling wood, or cooking wood in general. Instead of duplicating a celebrity figure or following a current fad, blaze your own trail into what pleases you and the people you are serving your amazing grilled and smoked foods from the wood fire to. With so many factors affecting a food’s taste, appearance, and aroma, it’s time to simply experiment, keep a log, and find what pleases you. It may turn out to be one hardwood that you feel is the wood or it could simply be the food that guides you. Hope you enjoyed our blog IS HICKORY THE WOOD TO SMOKE & GRILL WITH? 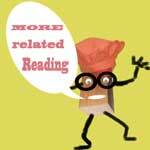 Additional reading the topic of wood species and other cooking ideas! 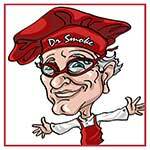 -WHAT’S IN THE SMOKINLICIOUS® WOOD CHUNK BOX? 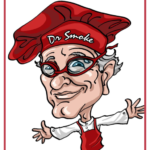 Dr. Smoke- “While hickory is the number one choice for Southern barbecue, it should not be your only choice. When asked YES-HICKORY THE WOOD TO SMOKE! We hope this latest posting was informative. Leave a comment or suggestion as we love hearing from you, especially when it comes to what you want to learn about next. As always, subscribe and follow us so you don’t miss out on the latest information. 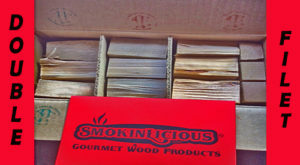 WHAT’S IN THE SMOKINLICIOUS® WOOD CHUNK BOX? Our double filet box of pristine, NO BARK, hardwood wood chunk for smoking ready for the next customer! These two questions have been quite common for the 12+ years we’ve been in business. What does a cubic foot box of wood weigh? How many pieces do you estimate are in a cubic foot box of wood? Due to the regulations imposed by The National Conference on Weights and Measures -Uniform Regulation for the Method of Sale of Commodities, we cannot specify weight on a wood product, even though we are a cooking wood. Instead, when asked about weight, we only provide an estimate clearly stating that wood is not sold by weight due to the variation in moisture level and density of the wood selected. I can, however, tell you the details that a recent first-time customer posted to an online forum that had me elated! This customer took a lot of time and effort to get to the details about our wood; the packaging and the weight not just of the carton, but of specific select pieces. This customer purchased the Serious Smoker Double Filet Wood Chunk which is our cubic foot carton product with the smallest chunk sizing. We offer an option to select up to 3 wood choices for this carton size, with this customer selecting our 3 most popular hardwoods: Hickory, Sugar Maple, and Wild Cherry. First, let’s look at this customer’s overall purchase. The packaged hardwood weighed in a 32.5 lbs. A total of 139 pieces of wood were packaged. Of that total, 48 pieces were Wild Cherry, 44 pieces Sugar Maple, and 47 pieces Hickory. This customer owns equipment that references specific weight of wood needed to smoke optimally. In this case, just 2-4 ounces of wood is ideal. The lowest weight of a Wild Cherry chunk (remember, these are all double filet) was 1.5 ounces and the highest was 4.1 ounces. The lowest weight of a Sugar Maple chunk was 2 ounces and the highest at 5.7 ounces. The lowest weight of a Hickory chunk was 2.8 ounces and the highest at 6.4 ounces. For this equipment user, there was an estimate that 139 pieces of hardwood would provide for some 100 smoking events! What I loved the most about this report is that it correlates specifically to the density of these 3 hardwoods. Hickory has the highest density of the 3 kinds of wood selected and this is reflected by the weight of the individual pieces sampled. Sugar Maple would be next in density followed by the Wild Cherry, all proven with the reported weights. Unquestionably, there is a lot of wood chunk pieces in a cubic foot carton! Which means you want to ensure you can use that much wood in a reasonable amount of time to maximize the freshness factor and peak level for function as a smoking wood. Individual pieces will vary in weight even if the dimensions of the pieces are relatively the same. That is the nature of a water-rich material – the water weight influences the overall piece weight. We are indebted to this customer for taking the time to inform us all of his findings since, by law, SmokinLicious® can’t offer this detail. We hope you liked this post. We’d love to hear from you so subscribe, comment and follow us on all social media platforms. Keep those suggestions coming for the future information you crave. –BOOST UP THE FLAVOR OF YOUR SMOKER BOX! ARE FRUITWOOD TREES LIKE THE APPLE “SNOW WHITE” BIT INTO? There is a fierce debate out there about the use of fruitwood trees, specifically apple and cherry varieties, for cooking purposes. 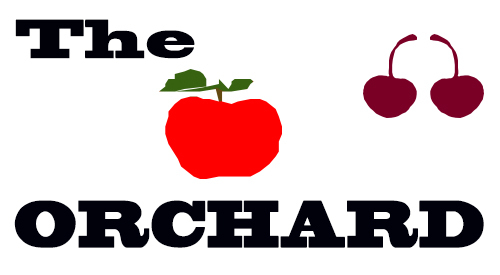 As a Company, we frequently get the same question – “Why don’t I see Applewood as an option to purchase?” Here’s the short answer: We do not, and will not, produce our products from orchard-based woods. 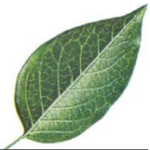 Our reason is simple – we do not believe in smoking foods over woods that have been or have the potential to be sprayed or growth enhanced with chemicals. Let’s review a fact about trees. All trees produce prussic acid, better known as hydrogen cyanide. We feel that humans can use woods produced in nature when they have been left alone, unburdened by the human hand in trying to manage what sometimes is the normal cyclical pattern of nature. In the areas in which we purchase the heartwood for our cooking wood production facility, the varieties of cherry (Prunus pensylvanica L.f.) we commonly deal with are: Northern Pin Cherry, Fire Cherry, Wild Red Cherry, and Pigeon Cherry. Of course, predominately, we bring in Wild Red Cherry. There are many different cherry tree varieties available throughout North America. 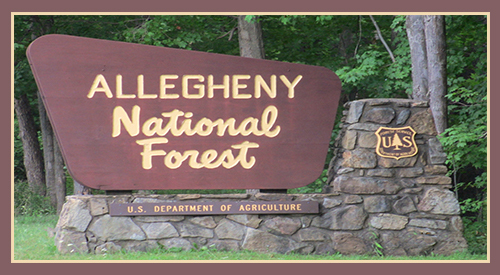 The main difference in these woods is that our forest trees, the type we manufacture, tend to be on the sweet-tart side versus the sour-bitter. For the most part, hydrogen cyanide is found mainly in the leaves and seeds of the cherry tree. Black Cherry bark is also commonly used in herbal cough remedies. The dominant opinion is that when used in small quantities, the hydrogen cyanide is a moot issue. Now let’s talk about the smoking application of wood. Cyanogenic compounds WOULD remain a factor in our production of cooking wood. This is because we do not allow our gourmet woods to deplete their moisture content to a level that other wood product manufacturers may (what is commonly referred to as “seasoning of the wood”). 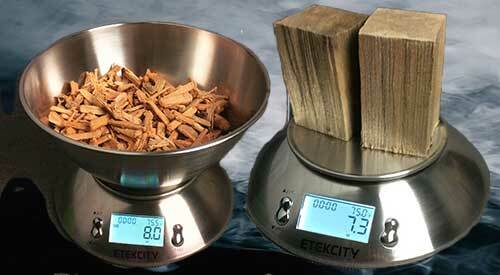 For ideal smoking of foods, wood needs to have a moisture level preferably at ~20%. This results in the wood smoldering rather than burning at a rapid rate. The resulting smoke from the plant material provides for that wonderful flavor. Because smoking is done at low temperatures for longer periods of time, the polycyclic aromatic hydrocarbons (PAH’s) found in wood molecules are not stimulated as they normally would be when cooking, say, a steak over a hot flame. Thus, the health risk associated with PAH’s and smoked foods is not considered an issue. The same can be said for ember cooking – using the heat of the residual coals to cook foods. 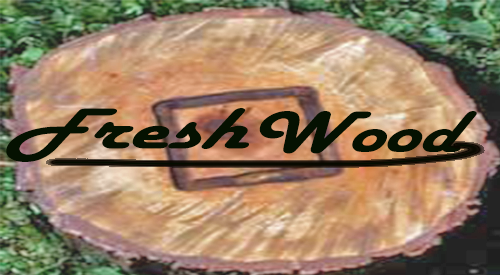 Our main concerns regarding woods used for wood-fired cooking methods is to always ensure a bark-free product. Bark does not hold moisture but rather is designed to rid the tree of wastes by absorbing them and locking them into this area. In fact, this is the reason why bark-on woods burn so much faster than bark-free wood pieces. This portion of the tree is responsible for temperature flare-ups, tainted smells, ‘spotty’ appearance of the food’s skin, creosote, an increase in the production of ash. Additionally, once the temperature is increased during wood-fired cooking, heterocyclic amines, or HCAs, are created due to the reaction of the amino acids and creatine with the higher cooking temperature. In a nutshell, a person is at greater risk of cyanide exposure in treated wood products for home construction than they are when consuming BBQ or other wood-fired foods. Knowing the source of the wood being used in the cooking application is vital to ensure that the necessary steps have been taken to prevent tree disease and pest infestation spread, as well as to ensure that the wood has not been exposed to any chemical/toxin treatments. It is our hope, that one day soon, inspection of the wood products used by restaurants, caterers, BBQ competitors, and grocery stores who promote smoked and natural-wood fired foods, will occur as normally as food inspections. After all, I think we all can agree that WHAT you cook the food over is just as important as what food you are cooking!